Audiences around the world have come to know the ambidextrous talent that is British percussionist Simon Phillips. Not unlike the great Billy Cobham before him, Phillips also sports a monster, 12-piece, left-handed drum set, deftly struck with flams and paradiddles aplenty. 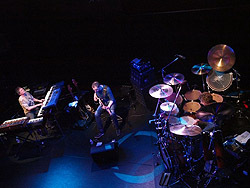 The group "PSP" developed when Phillips and bassist Pino Palladino recently joined forces on keyboadist Philippe Saisse’s CD “At World’s Edge. It was that collaboration, which sparked the idea of incarnating the trio into a full-fledged working unit. PSP arrived at Yoshi's in Oakland last night and concludes their fiery set tonight. “I’ve always had such tremendous respect and admiration for Simon and Pino as musicians, so playing with them in this trio is a dream come true for me,” admitted Saisse. “We discovered that we have an incredible synergy, and really compliment each other as live musicians,” added Phillips. The trio will also continue to pursue their solo endeavors as well.